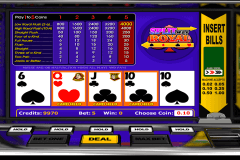 Double Bonus Poker by Betsoft is another example of their pyramid video poker with three separate paytables and weird wagering system. 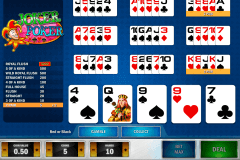 The same outdated design and average RNG is followed as a tradition, however, will this one look anyhow different among the other video poker games? 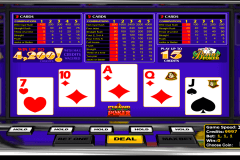 This free video poker is played with a standard deck and features no wild cards.The betting range varies between 1 and 5. The left and the right paytable work from right to left and from left to right for the first three cards in their direction respectively. For example, if you get three Jacks as the first three cards from left to right, the left paytable will pay for a Three of a Kind. Each paytable plays an independent bet, so when you wager 5, it means you spend 15 credits total. The minimal winning hand is Jacks or Better for each paytable. The RNG he is poor, to be honest. It is hard to understand why would they implement a bad RTP considering the triple bet system. The bonus round here is described in the title of the game. You can double up your winnings or lose them by guessing a card. Your cards should have a higher value than the dealer’s card to qualify. In the case of a draw, the round will be replayed. The number of attempts is not limited unless you reach the casino limit or lose. The RNG is not the best here as well. 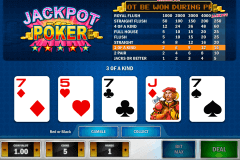 Overall, Double Bonus Poker by Betsoft is an okay online game, but it has nothing really special to offer. It requires no download and is very accessible to play, so it is up to you whether to try it or not.